The Kaiser Family Foundation is out with its September poll, which I think is interesting to look at for a few reasons. 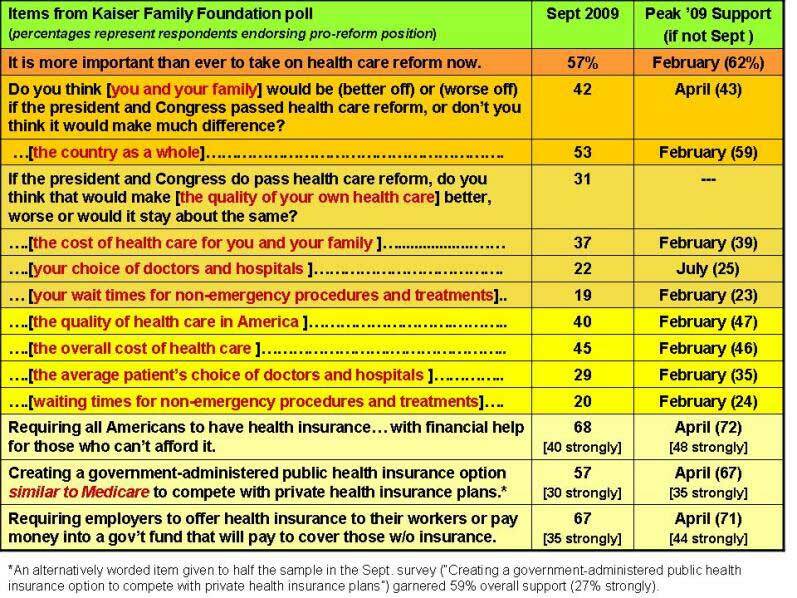 First, Kaiser has been polling every month from June 2009 forward and also conducted surveys in February and April of this year (six polls total during 2009), providing useful benchmarks for current trends. Second, this latest poll was in the field from September 11-18, making it a good gauge of the public’s short-term reaction to President Obama’s big health care speech on September 9. As seen in the following chart (which you can click to enlarge) in which I attempted to distill the key findings of this year’s Kaiser polling, pro-reform sentiment currently appears to be at — or near — peak levels for the year, depending on which items one looks at. 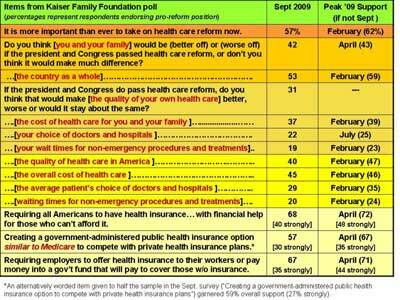 For example, the percentage of respondents currently saying “the quality of your own health care” would be better under a reformed system was the highest it has been all year, whereas belief that the health care of “you and your family” would be better off was only one point shy of an annual high. On the one hand, a skeptic might contend that support levels would be artificially high in roughly the week following the Obama speech (and South Carolina Republican Joe Wilson’s “You Lie” outburst). On the other hand, however, some of the figures to which the current ones are being compared were obtained in February and March, during the initial “honeymoon” months of Obama’s administration. One last thing to point out is that Kaiser did some split-sample experiments to test the effect of certain wordings. As I highlighted in the above chart, inclusion or exclusion of the phrase “similar to Medicare” did not have much effect on support for a public option. Dr. Alan Reifman (PhD, 1989, University of Michigan) is a Professor of Human Development and Family Studies at Texas Tech University. Among his other courses, he teaches introductory and advanced statistics for the graduate students in his department.